Does Your Roof Have T-Lock Shingles? You may notice that some residential roofs have shingles that resemble interlocking or jigsaw puzzle pieces. These are known as T-lock shingles. If you have these type of shingles, then our expert advice is to replace them if you can afford to do so. This is especially the case if you plan to sell your home one day. T-Lock shingles were a mainstay from the 1930s up until the 1980s. Installers used these for homes located in wind-prone cities. The shingles contained high concentrations of asphalt. 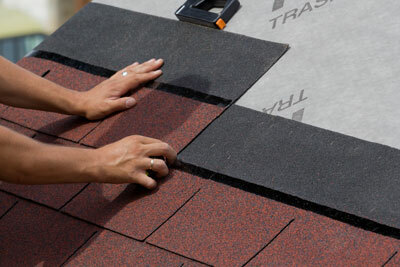 This increased the shingles’ weight, making them more resistant to heavy winds. However, as time went by, manufacturers began using less asphalt in order to cut down on production costs. This resulted in many T-lock shingles that were inferior because of low asphalt content or the use of lower-grade material. The T-lock variety is so fragile, in fact, that some home insurers will not insure roofs with these shingles. This is the case even if the shingles are backed by a lifetime warranty. Also, T-lock shingles are no longer manufactured. One reason is that when any part of the roof is damaged, you must replace the entire roof. A smart home buyer may add a contingency in the contract requiring the seller to replace the roof. In any case, a home valuation inspection will almost certainly pinpoint the T-lock shingles as a must-replace. Modern roofing materials, such as architectural shingles and metal roofing, have superior wind ratings compared to T-locks. See our testimonials or gallery of work to see the type of roofing jobs we do for Snohomish residences. Allied Construction highly recommends replacing T-lock shingles. It’s a simple investment that goes a long way should you decide to part with your home. Posted on July 28, 2017 under in Roofing Tips | By ignite.